Update: The Pacific 12 has announced that the officiating crew has been reprimanded. A bizarre ending at Tempe, as Wisconsin is unable to spike the ball and stop the clock, which would have enabled the Badgers to try a game-winning field goal. The clock runs out, the Pacific 12 officiating crew runs off the field and Arizona State wins, 32-30. 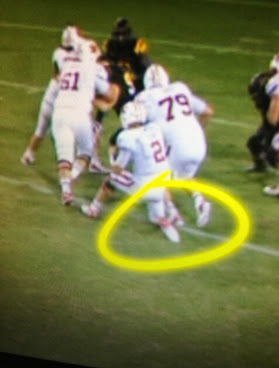 Below is an image from Chris Kalohn, which appears to show Wisky QB Joel Stave with his knee on the ground. (Click the image to enlarge.) One thing is clear: Listen for the whistle immediately after Stave put the ball down. That signals the play is over. Just saying, folks. I think the discussion starts from that point. But again, the knee isn't as important as the whistle, which signals the play dead. The umpire was slow to spot the ball after the Arizona State players piled on it. The umpire is in a tough spot. He likely didn't see Stave's knee touch and was slow to react after the Sun Devils jumped on the ball. But every official is part of a team and the referee, who likely blew the whistle, could have stepped in. Remember, officials make errors like the rest of us. Yes, it's a tough loss for Wisconsin and Badger fans are angry, but imagine how the officials must feel. Correspondent Greg Laughlin traveled Saturday to Madison, where the hometown Wisconsin Badgers took on Division I-AA Tennessee Tech. As expected, the Badgers rolled the Golden Eagles, 48-0, and have outscored two paperweight opponents, 93-0. The schedule gets considerably more difficult for Wisconsin, which plays Saturday at Arizona State. Then the Badgers will play host to Purdue before a trip to Ohio State on Sept. 28. Wisconsin plays host to Northwestern on Oct. 12, so the college football world will have a better idea on the strength of this team by mid-October. A shaky start for Wisconsin, which stands 3-2 after losing its Big Ten opener at Nebraska. But the Badgers remain the favorite to win the Leaders Division, in part because Ohio State and Penn State are ineligible for postseason competition. Wisconsin has to edge out Purdue, Indiana and Illinois for a trip to the Big Ten title game and shot at a third consecutive Rose Bowl. Yes, we could have used an action shot from Monday's Rose Bowl to lead this post, but we're all about giving customers what they want. And that means an image of the Oregon cheerleaders. This shot, along with the others after the jump, are courtesy of Image of Sport. You can view Image of Sport's full gallery by clicking here. As for the game, it was a classic, with the Oregon Ducks holding off the Wisconsin Badgers, 45-38. The latest installment in nose picking comes from Monday's Rose Bowl, where an unidentified Wisconsin coach digs deep and strikes gold. If you know the identity of the coach, please let us know.